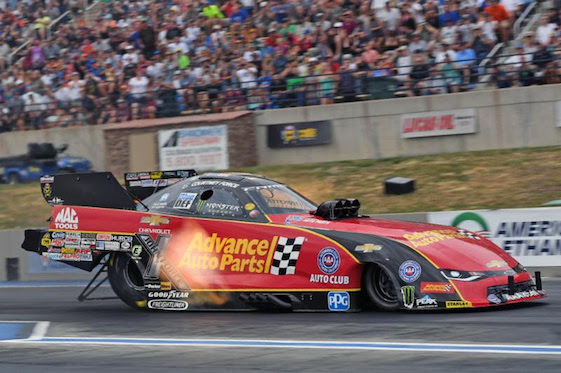 Courtney Force set both ends of the Funny Car track record Friday as John Force Racing posted a 1-2-3 sweep during the opening day of qualifications for the 38th annual Mopar Mile-High NHRA Nationals at Bandimere Speedway. Doug Kalitta (Top Fuel), Drew Skillman (Pro Stock) and Eddie Krawiec (Pro Stock Motorcycle) also emerged as provisional leaders in Morrison, Colo., near Denver at the 14th of 24 events on the 2017 NHRA Mello Yello Drag Racing Series schedule. This weekend’s race is the start of the series’ annual three-race summertime Western Swing. Force recorded a 1,000-foot pass in 3.889-seconds at 328.30 mph in her Advance Auto Parts Chevrolet Camaro SS during the first session. Force is aiming for her sixth pole of the season in addition to her first win of 2017. Sixteen-time world champion John Force, Courtney’s father, is second at 3.899-seconds and 301.87 mph in his Peak Performance Camaro SS. JFR teammate Robert Hight, the 2009 world champion, rounded-out the top three at 3.973-seconds and 315.56 mph in his Auto Club of Southern California Camaro SS. Courtney Force’s run came immediately after she watched her dad lower the track record in the first session with a run of 3.899-seconds at 301.87 mph. “The cool thing is (crew chief) Dan Hood, (co-crew chief) Ronnie Thompson, my entire team taking full advantage of the great conditions that we had in Q1,” Courtney said. “We were able to watch my dad lay down that 3.89, and we knew the track could handle it, so it was cool to watch him and then be able to run right after him with a 3.88 and get that top spot. Force has five poles this season, along with five track elapsed-time records _should she leave “The Mountain” with the record. Hight’s run of 3.973-seconds at 315.56 mph came in the first session, slotting him in the No. 3 spot. Kalitta leads the Top Fuel category with a track record 1,000-foot elapsed time of 3.767-seconds at 323.97 mph in his Mac Tools dragster during his second pass. Kalitta is searching for his second pole of the season and 49th of his career. Steve Torrence sits second after a pass in 3.775-seconds at 323.97 mph in his Capco Contractors dragster, while eight-time world champ Tony Schumacher of Don Schumacher Racing is third at 3.776/326.63 in his U.S. Army dragster. In Pro Stock, Skillman earned the provisional top spot after covering the quarter-mile in 6.925-seconds at 197.94 mph in his Ray Skillman Chevrolet Camaro during the only Pro Stock session of the day due to inclement weather. Skillman is chasing his first pole of the season following his first victory in 2017 at Route 66 Raceway in Joliet, Ill.
Two-time world champion Erica Enders is second at 6.944-seconds and 198.17 mph in her Elite Motorsports Camaro. Four-time world champion Greg Anderson is third at 6.958/196.70 in his Summit Racing Equipment Camaro fielded by Ken Black Racing. Krawiec sits atop the Pro Stock Motorcycle order after a quarter-mile pass in 7.178-seconds at 185.66 mph aboard his Screamin’ Eagle Vance & Hines Harley-Davidson V-Rod during his only pass of the day. Krawiec is aiming for his 35th career pole and the second of this season. Hector Arana Jr. is in the No. 2 slot after running 7.191-seconds at 186.36 mph aboard his Lucas Oil Buell during his second pass, while reigning series champion Jerry Savoie sits third at 7.206/183.37 aboard his White Alligator Racing Suzuki. Top Fuel _ 1. Doug Kalitta, 3.767-seconds, 323.97 mph; 2. Steve Torrence, 3.775, 323.97; 3. Tony Schumacher, 3.776, 326.63; 4. Brittany Force, 3.782, 318.84; 5. Shawn Langdon, 3.795, 313.37; 6. Leah Pritchett, 3.801, 318.09; 7. Clay Millican, 3.910, 251.44; 8. Bob Vandergriff Jr., 3.913, 274.16; 9. Antron Brown, 3.941, 308.50; 10. Terry McMillen, 4.022, 293.92; 11. Scott Palmer, 4.082, 230.53; 12. Terry Haddock, 4.224, 275.56; 13. Troy Coughlin Jr., 6.287, 111.69; 14. Greg Carrillo, 7.483, 108.78. Funny Car _ 1. Courtney Force, Chevy Camaro, 3.889, 328.30; 2. John Force, Camaro, 3.899, 301.87; 3. Robert Hight, Camaro, 3.973, 315.56; 4. Cruz Pedregon, Toyota Camry, 3.981, 300.06; 5. Tim Wilkerson, Ford Mustang, 3.989, 319.82; 6. Jonnie Lindberg, Camry, 3.993, 319.98; 7. Alexis DeJoria, Camry, 4.010, 322.65; 8. Ron Capps, Dodge Charger, 4.016, 303.37; 9. Jack Beckman, Charger, 4.024, 319.60; 10. J.R. Todd, Camry, 4.078, 308.35; 11. Tommy Johnson Jr., Charger, 4.266, 219.47; 12. Del Worsham, Camry, 4.320, 232.07; 13. Todd Simpson, Charger, 4.342, 248.07; 14. Jeff Diehl, Toyota Solara, 4.398, 295.79; 15. Jim Campbell, Charger, 5.316, 133.38; 16. Matt Hagan, Charger, 5.544, 113.27. Pro Stock _ 1. Drew Skillman, Chevy Camaro, 6.925, 197.94; 2. Erica Enders, Camaro, 6.944, 198.17; 3. Greg Anderson, Camaro, 6.958, 196.70; 4. Jason Line, Camaro, 6.959, 198.06; 5. Allen Johnson, Dodge Dart, 6.959, 197.48; 6. Vincent Nobile, Camaro, 6.966, 197.65; 7. Matt Hartford, Camaro, 6.968, 196.13; 8. Bo Butner, Camaro, 6.981, 196.87; 9. Chris McGaha, Camaro, 6.984, 196.10; 10. Jeg Coughlin Jr., Camaro, 7.004, 196.33; 11. Alan Prusiensky, Dart, 7.080, 194.60; 12. Deric Kramer, Dart, 7.494, 181.62; 13. Richie Stevens, Dart, 7.648, 141.53; 14. Tanner Gray, Camaro, 12.716, 69.10. Pro Stock Motorcycle _ 1. Eddie Krawiec, Harley-Davidson, 7.178, 185.66; 2. Hector Arana Jr., Buell, 7.191, 186.36; 3. Jerry Savoie, Suzuki, 7.206, 183.37; 4. Matt Smith, Victory, 7.217, 185.49; 5. Andrew Hines, Harley-Davidson, 7.225, 185.89; 6. LE Tonglet, Suzuki, 7.229, 183.32; 7. Karen Stoffer, Suzuki, 7.270, 183.05; 8. Cory Reed, Victory, 7.275, 181.37; 9. Joey Gladstone, Suzuki, 7.276, 183.92; 10. Scotty Pollacheck, Suzuki, 7.294, 181.28; 11. Melissa Surber, Buell, 7.387, 183.79; 12. David Hope, Buell, 7.410, 179.92; 13. Mike Berry, Buell, 7.444, 177.63; 14. Lance Bonham, Buell, 7.477, 178.31; 15. Andie Rawlings, Suzuki, 8.162, 165.56; 16. Angelle Sampey, Victory, 10.283, 79.50. Not Qualified _ 17. Angie Smith, 11.113, 75.25.